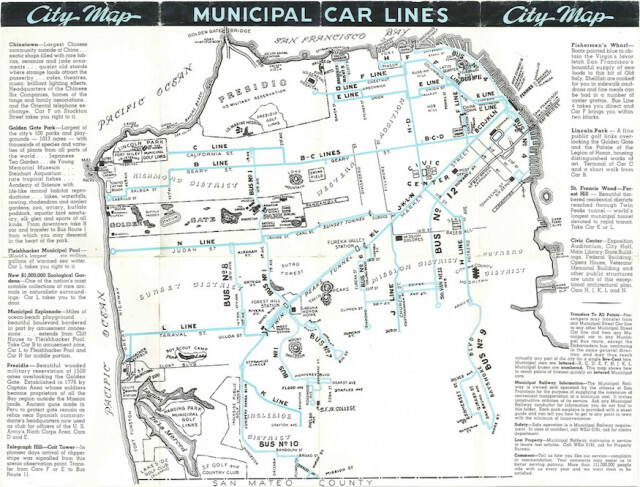 The good people at Curbed have combed through lots of old San Francisco maps, including this 1940s Muni map (courtesy of our favorite map nerd, Eric Fischer). You’ll see that the F used to go through the Stockton tunnel, and there was no M line at the time. Click here to see a bigger version of the map. Oh, and here are some more Muni maps from 1920s and 1930s. The Curbed story has lots more old fascinating maps of our city. Go on and check ’em out! h/t our friends at Tiny Rides. thanks, guys! 2-Sutter would be a trolley bus service. The “M” line was actually started in October 1925 as a shuttle car from West Portal to Broad & Plymouth, connecting with the “K” & “L” at West Portal. In October1927, partial through service to the Ferries commenced. But due to lack of ridership, the “M” was discontinued entirely in August 1939. But on the map, the blue line that says “Bus 10” is actually the “M” route as far as Broad & Plymouth. The “M” line was restored to full route service to the Ferries in December 1944. On another note, it’s interesting that this map does not show any streetcar lines going to the new East Bay Terminal at 1st & Mission, even though alternate cars on several MUNI lines were already going there as of early 1939. Back in those days Muni was competing with the larger, privately-owned Market St. Railway. But the private company was struggling with trying to turn a profit, keeping its own system in one piece, the after-effects of the Depression and the coming war. By 1944, Market St. Ry. was about to throw in the towel and agree to merge with Muni. Then Muni would have struggle with keeping everything running (which it did by converting every Market St. Ry. streetcar line to bus (or abandon like the 40 San Mateo Interurban) by 1949).